Few cars have us salivating quite as profusely as the 2016 Cadillac ATS-V coupe and sedan. The numbers speak for themselves – 455 hp, 0-60 in 3.9 seconds, and a top speed of 185 MPH – but there's more to the ATS-V story than just bench-racing statistics. 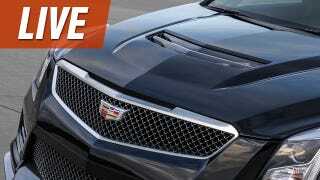 That's what Cadillac's chief engineer is here to answer. This is John Barrick's baby. He's the program engineering manager for the ATS-V, while Tony Roma is the man behind the new CTS and chief engineer for the V Series. Both have worked on every V that Cadillac has ever put out. So what do you want to know about the ATS-V? There's the third generation Magnetic Ride Control, Performance Traction Management system, and a reworked chassis to take advantage of it all – not to mention that screaming twin-turbo'd V6. Ask away and we'll get them to answer as many questions as possible before they find the key to the handcuffs we've hidden underneath their seats. Great questions! Our Caddy friends have to run off to meetings and I just gave them the handcuff keys. Thanks!